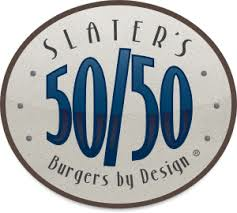 Slater’s 50/50 was founded in 2009 in by Scott Slater, a SoCal native. Inspired by the belief that bacon is meat candy, Scott created the original 50/50 patty, made of 50% ground bacon and 50% ground beef, and a menu full of amplified burgers and indulgent dishes to pair with their selection of local and regional craft beer on tap. Monday 3-6pm: $5 cocktails and house wine glass, half off wine bottles. $4-$8 appetizers. Tuesday 3-6pm: $5 cocktails and house wine glass, half off wine bottles. $4-$8 appetizers. Wednesday 3-6pm: $5 cocktails and house wine glass, half off wine bottles. $4-$8 appetizers. Thursday 3-6pm: $5 cocktails and house wine glass, half off wine bottles. $4-$8 appetizers. Friday 3-6pm: $5 cocktails and house wine glass, half off wine bottles. $4-$8 appetizers.